Professional musician Maureen Hurd Hause has had a frantic morning. She’s had to get her two daughters, Elena, 7, and Nora, 2, ready for their day. Then she’s driven from her home in West Orange, N.J., to meet Jim and me at Carnegie Deli in Midtown Manhattan. When she dashes in, she’s out of breath and smiling. The 1994 music grad has one of the sunniest dispositions I’ve ever encountered. After a cup of coffee and a quick chat, we head out onto the street where Jim takes pictures of Maureen playing her clarinet on the corner of 7th Avenue and 57th Street, with New Yorkers, tourists, and taxi drivers all around. With Jim at her feet, Maureen throws back her head and joyfully plays Gershwin’s Rhapsody in Blue. And I feel like I’m in a Woody Allen movie. Maureen grew up in tiny Ida Grove, Iowa. She began taking private clarinet lessons with ISU music professor Joseph Messenger during her freshman year of high school. “It was 100 miles each way for three years,” Maureen remembers. At Iowa State, Maureen was a member of the orchestra and wind ensemble and continued to study with Messenger. “I had wonderful, amazing teachers in the Music Department,” she says. She followed up her Iowa State degree with three graduate degrees from the Yale University School of Music. 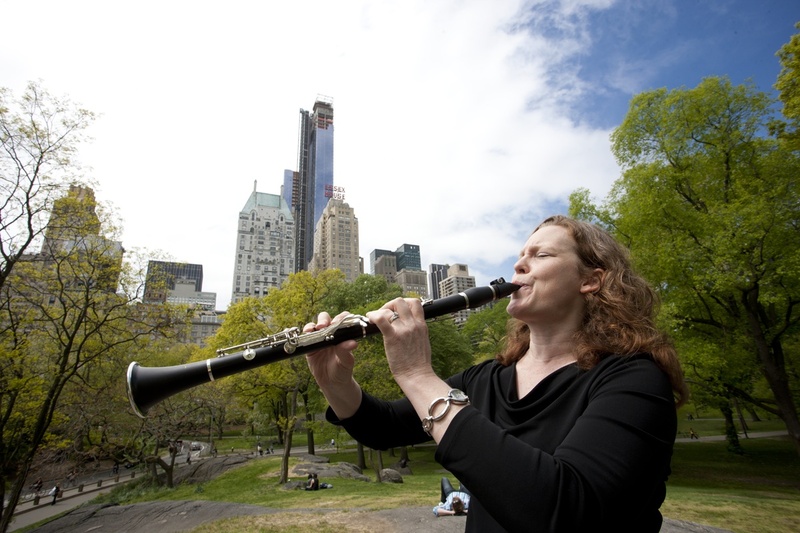 Today Maureen teaches clarinet in the Mason Gross School of the Arts at Rutgers University, and she’s also a freelance musician in the New York City area. The New York Times called one of Maureen’s performances at Carnegie Hall (not coincidentally right across the street from our meeting place at Carnegie Deli) “striking” and “vibrantly played.” She has performed with the American Symphony Orchestra, New York City Opera Orchestra, Metropolitan Opera Orchestra, and the Lincoln Center Chamber Music Society. She’s a classical clarinetist but loves Benny Goodman, and she’s recorded a number of CDs, including a solo CD. “I tried to record things that hadn’t been recorded before,” she said, adding that some of the numbers were composed by her husband, Evan Hause. As if playing on the streets of New York were not enough, Maureen happily agreed to play for us in Central Park, and, again, we drew a happy crowd.